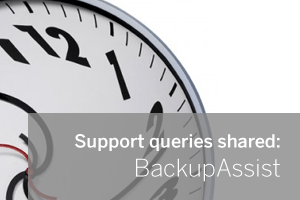 Network shares stopped working in BackupAssist? It’s just a matter of time. We often get support queries where the PC clock has been the cause of an issue but never have I seen a few minutes of drift make such a difference. This error message was actually a bit misleading as the login details hadn’t been changed. When the user then went to test the log on it would also fail. However the issue was not the username or password. The actual problem was that the time and date on the NAS had slowly drifted so it was out of sync with the server running BackupAssist. In this case I’m only talking about 6 minutes but this was enough for the windows authentication to fail. The quick fix is to reset the clock on the NAS to the correct time. Strangely this NAS was already synchronising with the server clock using NTP, but because it was only configured to do this once per week and it would appear that over 7 days the clock would still be able to drift enough to cause problems. The simple solution here was just to up this frequency so it’s now performing a clock sync every hour instead. It’s worth noting this appears to affect Windows clients and servers in the same way so you may find the same fix will help there too. One to bear in mind – hope it comes in handy one day! I imagine this share was using Kerberos authentication, probably as part of an Active Directory, and that was the reason.